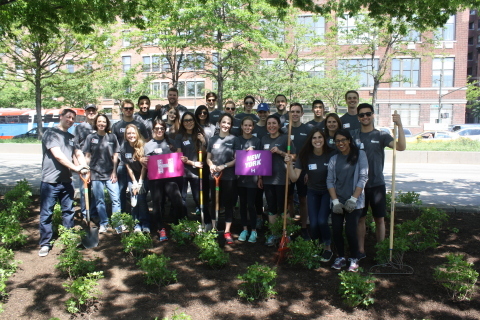 Huron Consulting Group Employees to Lead Nearly 100 Volunteer Events in 2016 Day of Service | Huron Consulting Group Inc.
CHICAGO--(BUSINESS WIRE)--May 11, 2016-- As part of its commitment to serving the community, Huron Consulting Group (NASDAQ: HURN), a leading provider of business consulting services, will provide all employees time off to participate in volunteer projects on May 13, 2016. The Company’s annual Day of Service is an opportunity for employees to give back through activities such as mentoring students to help them stay on the path to work readiness, beautifying local parks and preparing food for those in need. Huron is a culture-driven organization that strives to make a positive impact on the communities it serves. Year round, through its Huron Helping Hands program, the company encourages employee involvement in civic sponsorships, community service and pro bono activities. Huron collaborates with partner organizations, such as the American Heart Association, American Red Cross, Junior Achievement and Ronald McDonald House Charities, in locations across the country, and encourages employees to give to the charities and causes they care about through a matching gifts program. Headquartered in Chicago, Huron has a worldwide workforce of nearly 3,000 professionals. To learn more about Huron’s Day of Service, visit www.huronconsultinggroup.com/HuronHelpingHands for a complete list of affiliated organizations. In addition, connect with us on Facebook at www.facebook.com/huronconsulting for updates on our Day of Service.